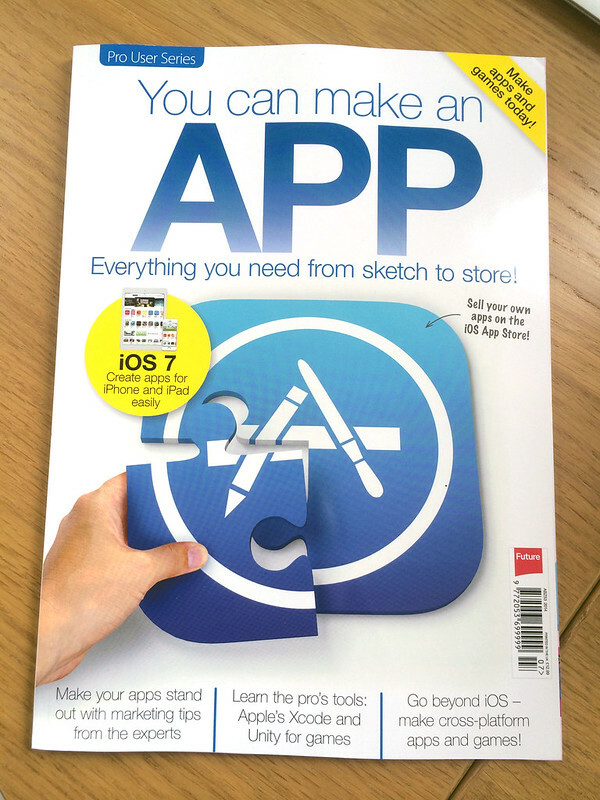 Future Publishing’s “You can make an app” bookazine (160+ pages) is out now, on paper and in digital format. Paper copies are in UK and US newsagents, supermarkets, airports and so forth (and very likely in other countries too). For a digital copy, grab the MacFormat iOS app, from the App Store. It’s also on Zinio. I wrote the “Principles of app design” 5-page intro spread, where I talk about refining your idea, choosing features, designing the interface and interaction, and focusing on the user. I’m pretty pleased with it. It features writing from well-known and variously beloved dev/tech industry luminaries like Martin Pilkington, Dave Verwer, Jaimee Newberry, Craig Grannell, Keith Martin, Gary Riches, Lou Hattersley and more. As well as me, the hanger-on in the group. It looks like this - only bigger, and noticeably three-dimensional. Long-time readers who enjoyed my Dev Zone columns in the now-sadly-defunct Tap! magazine (still hard to believe I wrote for every single one of the 32 issues - a round number, if you’re a developer) can consider this new piece to be a celebration, synthesis, spiritual successor, and send-off to Dev Zone. If you happen to pick up a copy, I hope you’ll enjoy it.